This species is 36 to 40 cm (14–16 in) long, plus up to 65 cm (26 in) of tail streamer for the male, and weighs about 210 g (7.4 oz). It is the largest representative of the trogon order. 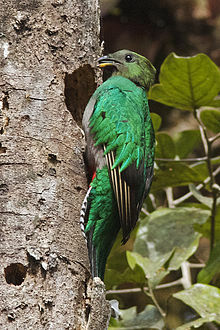 The subspecies costaricensis is slightly smaller than the nominate race, with tail plumes that are both shorter and narrower. Resplendent quetzals create their nests over 200 feet up in the air and court in the air with specific calls. Six specific vocal calls have been recorded: the two-note whistle, gee-gee, wahc-ah-wahc, wec-wec, coouee whistle, uwac, chatter, and buzzing. The first call is related to male territorial behavior, while the coouee whistle is identified as a mating call. Resplendent quetzals usually live alone when not breeding. They are monogamous territorial breeders, with the territory size being measured in Guatemala as 6–10 ha (15–25 acres). They are also seasonal breeders, with the breeding season being March to April in Mexico, May to June in El Salvador and March to May in Guatemala. When breeding, females lay two pale blue eggs in a nest placed in a hole which they carve in a rotten tree. Resplendent quetzals tend to lay two clutches per year and are known to have a high rate of nest failure, around 70 percent. A tree in the required stage of decomposition is susceptible to weather damage, and the availability of suitable trees may limit the resplendent quetzal population. 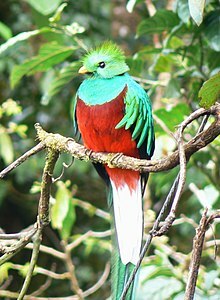 The resplendent quetzal is classified as near threatened on the IUCN Red List due to habitat loss. However, it does occur in several protected areas throughout its range and is a sought-after species for birdwatchers and ecotourists. The resplendent quetzal was considered divine, associated with the "snake god", Quetzalcoatl by Pre-Columbian Mesoamerican civilizations. Its iridescent green tail feathers, symbols for spring plant growth, were venerated by the ancient Aztecs and Maya, who viewed the quetzal as the "god of the air" and as a symbol of goodness and light. The Maya also viewed the quetzal symbolizing freedom and wealth, due to their view of quetzals dying in captivity and the value of their feathers, respectively. Mesoamerican rulers and some nobility of other ranks wore headdresses made from quetzal feathers, symbolically connecting them to Quetzalcoatl. Since it was a crime to kill a quetzal, the bird was simply captured, its long tail feathers plucked, and was set free. In several Mesoamerican languages, the term for quetzal can also mean precious, sacred, or erected. ^ Eisenmann, E. (1959). "The Correct Specific Name of the Quetzal, Pharomachrus mocinno". Auk. 76 (1): 108. doi: 10.2307/4081862. ^ Dayer, Ashley. Neotropical Birds Online (T. S. Schulenberg (ed.). "Resplendent Quetzal (Pharomachrus mocinno)". Cornell Lab of Ornithology. Retrieved 23 December 2011. ^ a b c H., Ma. Lourdes Avila; O., V. Hugo Hernandez; Verlarde, Enriqueta (25 May 1996). "The Diet of Resplendent Quetzal (Pharomachrus Moncinno mocinno: Trogonidae) in a Mexican Cloud Forest". Biotropica. 28 (4): 720–727. doi: 10.2307/2389058. JSTOR 2389058. ^ Collar, N.J. (2001). "Family Trogonidae (Trogons)". In del Hoyo, J.; Elliott, A.; Sargatal, J. (eds.). Handbook of the Birds of the World. Vol. 6 Mousebirds to Hornbills. Barcelona, Spain: Lynx Edicions. pp. 126–127. ISBN 84-87334-30-X. ^ Orellana, Claudia (2004). "Quetzals Bred in Captivity in Chiapas". Frontiers in Ecology and the Environment. Ecological Society of America. 2 (7): 345. doi: 10.2307/3868355. JSTOR 3868355. Williamson, Sheri L.; Colston, P.R. (2003). "Trogons". In Christopher Perrins (ed.). Firefly Encyclopedia of Birds. Firefly Books. pp. 362–363. ISBN 1-55297-777-3.